Long introduction, I know, but context is needed from time to time... this week the momentum indicator line has extended its push upward past the confluence of the TLs (chart above), and its next higher target remains the long-term DTL... watching. There's a lot happening between now and then, but at least this provides some measure of context to my longer-term forecasting... watching. Edited by tsharp, 06 April 2019 - 01:45 PM. 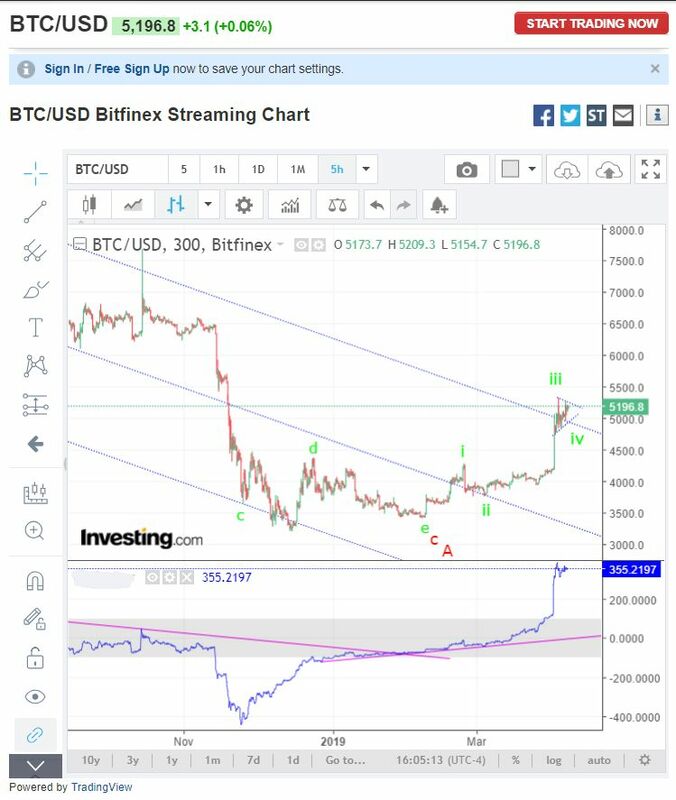 I constructed an Andrews Pitchfork, with a modified Schiff setting which amazingly matches the upward channel and also suggests a low in the 950-1000 range, depending on how quickly it moves downward... watching. If the momentum indicator line stalls at the zero support level, with the price holding around the present range, then there's a chance one last push upwards to that price DTL is possible... watching. Edited by tsharp, 21 April 2019 - 08:36 AM. 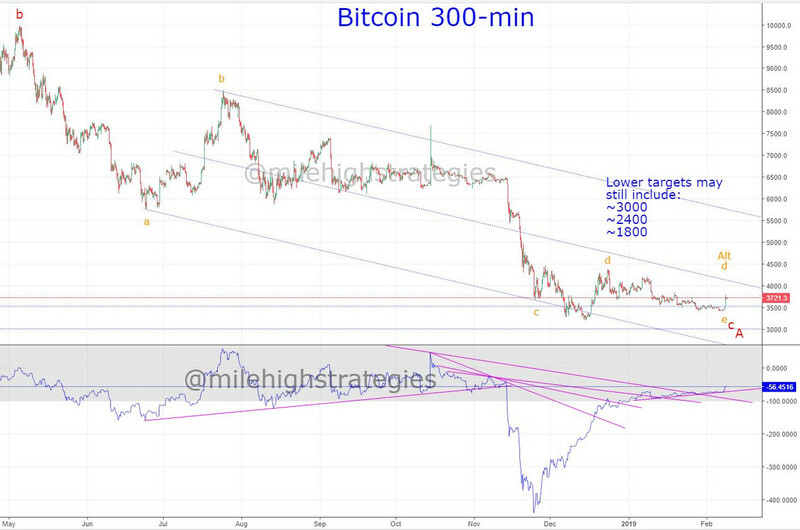 What kind of an Elliott wave correction is that where the B wave (which is correcting the A wave) goes below the lowest point of A? I would've thought that would immediately rule out that it's a B and is instead ongoing A or wave C? Thanks. Corrective waves can and do run... there is no such rule in fractal theory. A wave-ii cannot correct more than a wave-i and a wave-iii must not be the shortest impulsive wave, though expanding corrective waves are fairly common, such as the Wave-IV that took place in 1966-1974, which is only another type of corrective fractal wave. In the example you've shown, B doesn't go below the low of A so it actually corrected A as expected. The above is an expanded flat which is relatively common in Elliott wave. 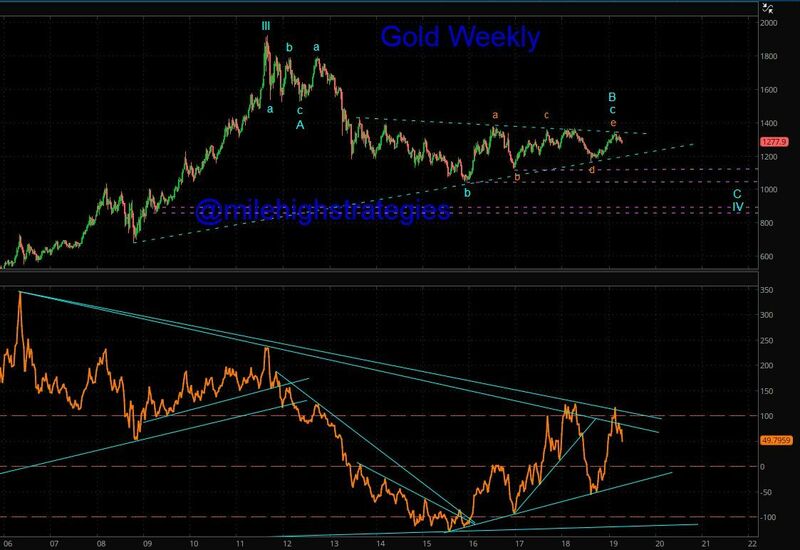 In the previous gold chart, B doesn't correct A since it continues in the same direction as A, beyond the extent A has gone. 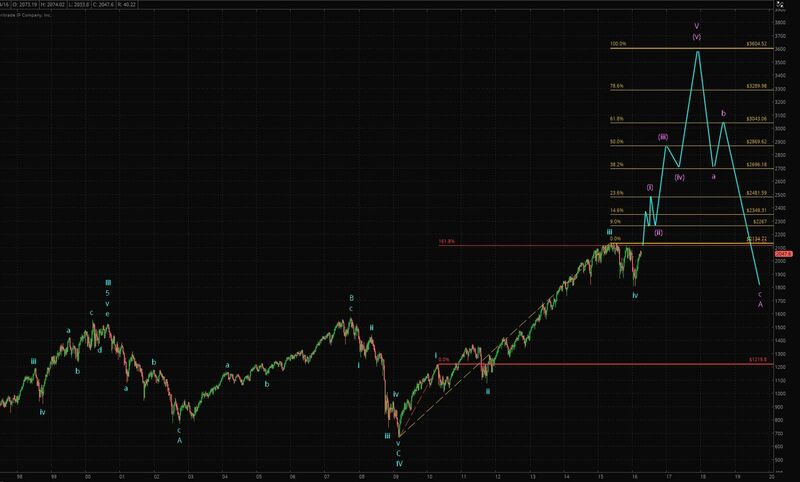 That is why I don't recognize it as a valid Elliott wave. I would argue that once it has gone further in the direction that A went, A's termination point requirew revision, or the B wave has already changed into a C wave. 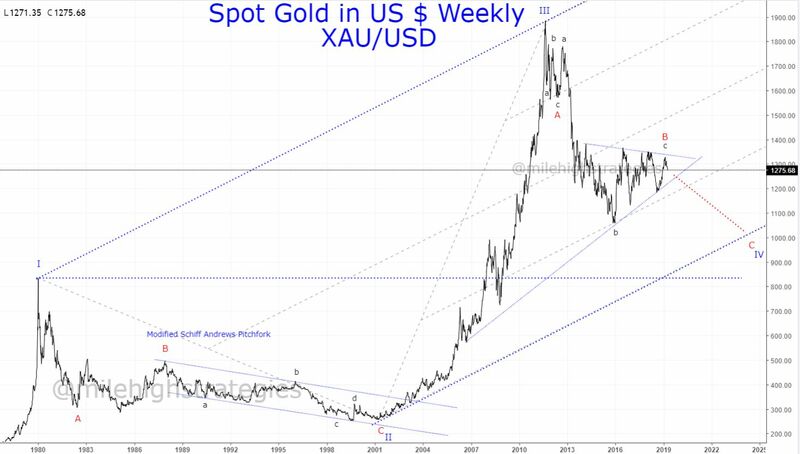 Okie dokie... you label your charts as you see fit, and I'll do the same for mine... quite honestly, there are many methods employed by good technicians under the banner of Elliott Wave (Glen Neeley and David Bensimon come to mind). 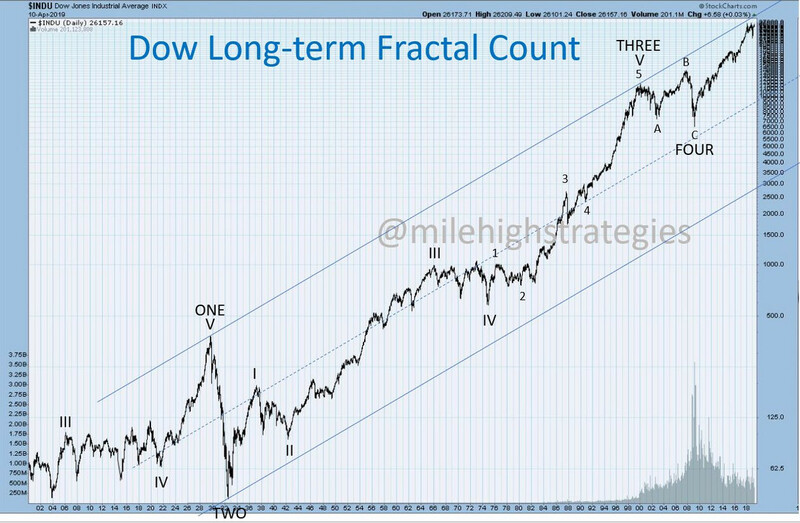 I purposely have not used EW, with the hopes of not creating even more division among the ranks - I've called my wave work, fractal theory for years now, and the labels I've put on my chart are in accordance with correct fractal theory rules. Here's another example of a b-wave dropping below the level of the c-wave of one order of magnitude higher, and the c-wave did not even rise to the level of the previous a-wave of the same order. I would suggest thinking more outside the box when it comes to corrective waves, especially when they are in diagonal triangles (3-3-3-3-3-3)... they often perform like this and often also truncate in the e-wave position, though in this example the e-wave did drop just a bit lower than the previous c-wave. BTW, That bottom was called in real time on 2-9-19. Edited by tsharp, 21 April 2019 - 10:46 PM.